Orbital compartment syndrome is an ocular emergency that requires expedient diagnosis and management to prevent blindness. The orbit is a relatively closed compartment with limited ability to expand, and orbital pressure can rise rapidly when an acute increase in orbital volume occurs. Untreated, orbital compartment syndrome results in ischemia of the optic nerve and retina. For more information, see Medscape Reference article Acute Orbital Compartment Syndrome. The most common causes of orbital compartment syndrome include retrobulbar hemorrhage from trauma, retrobulbar anesthetic injection, and eyelid surgery. Spontaneous retrobulbar hemorrhage due to venous anomalies, atherosclerosis, intraorbital aneurysm of the ophthalmic artery, hemophilia, leukemia, von Willebrand disease, and hypertension has also been described. Other less common causes of orbital compartment syndrome include orbital cellulitis, orbital abscess, tumors, orbital emphysema, inflammation, and extensive burns. Patients with increased orbital pressure present with pain, decreased vision, diplopia, limited extraocular movements, proptosis, ecchymosis around the eye, bloody chemosis, increased intraocular pressure (IOP), resistance to retropulsion, and a relative afferent pupillary defect. The orbit, which protects, supports, and maximizes the function of the eye, is shaped like a quadrilateral pyramid, with its base in plane with the orbital rim. Seven bones conjoin to form the orbital structure, as shown in the image below. 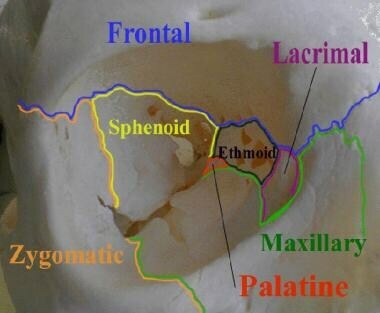 The lateral orbital wall is formed by the greater wing of the sphenoid and the zygoma. The lateral canthal tendon has a superior and inferior crus that inserts at the lateral orbital tubercle (Whitnall tubercle) 3 mm posterior to the lateral orbital rim. For more information about the relevant anatomy, see Orbit Anatomy and Eye Globe Anatomy. Lateral canthotomy may also be considered in patients with retrobulbar hemorrhage along with any of the following: ophthalmoplegia, cherry-red macula, optic nerve head pallor, and severe eye pain. Glaucoma drops do not decrease intraorbital pressure. Suspected globe rupture is a relative contraindication to lateral orbital canthotomy. Signs of globe rupture include hyphema; a peaked, teardrop-shaped, or otherwise irregularly shaped pupil; exposed uveal tissue, which appears brownish; and extraocular movement restriction that is greatest in the direction of the rupture. Subtle signs of globe rupture include subconjunctival hemorrhage, enophthalmos, or a conjunctival laceration. For more information, see Medscape Reference article Globe Rupture. Local anesthesia (lidocaine 1-2% with epinephrine) is injected into the lateral canthus. The patient should be supine with the head of the bed elevated 10-15°. Unexpected patient head movement can result in iatrogenic injury, including accidental globe puncture. If the patient is nervous and space permits, attempt to place a cornea protector. Taping or restraining the head with an assistant or sedation may be required. Extremely uncooperative patients may require sedation or, rarely, general anesthesia. Confirm the affected eye and perform a repeat inspection, noting the typical findings of unilateral proptosis, an afferent pupillary defect, decreased visual acuity, and an intraocular pressure (IOP) of 40 mm Hg or higher. Provide adequate anesthesia by injecting 1 mL of lidocaine 1-2% with epinephrine into the lateral canthus. Direct the needle tip toward the lateral orbital rim and begin injecting when the needle touches bone. The combination of lidocaine with epinephrine assists with hemostasis and local anesthesia. Irrigate the eye with normal saline to clear away debris that may enter the eye or interfere with the procedure. Use a straight hemostat to clamp (crimp) the skin at the lateral corner of the patient's eye. Clamp the skin all the way down to the orbital rim for 1-2 minutes. Clamping facilitates hemostasis and marks the location where the incision is to be made. See video below. Crimping the lateral orbital canthus to mark where to cut the skin. Use forceps to pick up the skin around the lateral orbit. Use the scissors to make a 1-cm incision beginning at the lateral corner of the eye and extending laterally outward. See video below. This incision decreases some pressure but is often insufficient alone; therefore, proceed to cantholysis. Apply continuous retraction on the lower lid and palpate the lateral canthus tendon. The author prefers to pull the lid downward. Others retract the lid superolaterally. With the scissors directed along the lateral orbital rim (pointing away from the globe), palpate and dissect the inferior crux of the lateral canthus tendon and cut it. See video below. Cutting the inferior canthal ligament/tendon. If this procedure is insufficient (ie, IOP remains >40 mm Hg), the superior portion of the lateral tendon can be dissected and then cut. See video below. Verifying laxity of the lower lid after inferior cantholysis. Orbital compartment syndrome is an ocular emergency that requires early recognition and treatment to prevent blindness. The essential component that relieves the orbital pressure is the cantholysis, not the canthotomy. Maintain firm retraction on the lower lid. Tonometry and globe palpation are contraindicated in patients with an open globe injury. If inferior cantholysis does not decrease the orbital pressure, a superior cantholysis should also be performed. If the latter does not decrease the intraocular pressure, orbital decompression should be considered. Whenever feasible, seek emergent consultation with an ophthalmologist when this procedure is performed. Treatment should not be delayed to obtain imaging. The relative afferent pupillary defect, or Marcus Gunn pupil, is tested using the swinging flashlight test. The result is positive when the affected pupil appears to dilate in response to light (the other normal pupil also dilates when light is shone in the affected eye). Both pupils constrict when the light is shone in the normal eye. The Marcus Gunn pupil results from injury to the afferent fibers of cranial nerve II of the defective eye, while the efferent signals from cranial nerve III of the normal eye are uninjured. For more information, see the Medscape Reference article Neuro-Ophthalmic Examination. Complications include iatrogenic injury to the globe or lateral rectus; ptosis due to damage to the levator aponeurosis, which is located superiorly  ; and injury to the lacrimal gland and lacrimal artery, which also lie superiorly. Less common complications include bleeding and infection. Extensive cantholysis may result in ectropion. Irreversible vision loss can occur if retina ischemia time is greater than 90-120 minutes. If there is corneal exposure, lubricating ointment and a plastic moisture chamber (eg, Tegaderm patch) can be applied without pressure on the globe. Do not apply cotton patches or pressure patches over a proptotic globe. What is orbital compartment syndrome? Which anatomy is relevant to lateral canthotomy and cantholysis? What are the indications for lateral canthotomy and cantholysis? What are the contraindications for lateral canthotomy and cantholysis? What is the role of anesthesia in the performance of lateral canthotomy and cantholysis? What equipment is needed to perform lateral canthotomy and cantholysis? How are patients positioned prior to performing a lateral canthotomy and cantholysis? How is a lateral canthotomy and cantholysis performed? What are pearls for performing lateral canthotomy and cantholysis? What are the possible complications of lateral canthotomy and cantholysis? Carrim ZI, Anderson IW, Kyle PM. Traumatic orbital compartment syndrome: importance of prompt recognition and management. Eur J Emerg Med. 2007 Jun. 14(3):174-6. [Medline]. Larsen M, Wieslander S. Acute orbital compartment syndrome after lateral blow-out fracture effectively relieved by lateral cantholysis. Acta Ophthalmol Scand. 1999 Apr. 77(2):232-3. [Medline]. Popat H, Doyle PT, Davies SJ. Blindness following retrobulbar haemorrhage--it can be prevented. Br J Oral Maxillofac Surg. 2007 Mar. 45(2):163-4. [Medline]. Rosen P, Barkin R. Emergency medicine: Concepts and Clinical Practice. St Louis, Mo: Mosby; 2009. Chap 69. Winterton JV, Patel K, Mizen KD. Review of management options for a retrobulbar hemorrhage. J Oral Maxillofac Surg. 2007 Feb. 65(2):296-9. [Medline]. Goodall KL, Brahma A, Bates A, Leatherbarrow B. Lateral canthotomy and inferior cantholysis: an effective method of urgent orbital decompression for sight threatening acute retrobulbar haemorrhage. Injury. 1999 Sep. 30(7):485-90. [Medline]. McInnes G, Howes DW. Lateral canthotomy and cantholysis: a simple, vision saving procedure. Canadian Journal of Emergency Medicine. 2002. 4:49-52. [Full Text]. Roberts JR, Hedges JR, eds. Clinical Procedures in Emergency Medicine. 5th ed. Portland, Ore: WB Saunders Co; 2009. Chap 63. Vassallo S, Hartstein M, Howard D, Stetz J. Traumatic retrobulbar hemorrhage: emergent decompression by lateral canthotomy and cantholysis. J Emerg Med. 2002 Apr. 22(3):251-6. [Medline]. Shek KC, Chung KL, Kam CW, Yau HH. Acute retrobulbar haemorrhage: an ophthalmic emergency. Emerg Med Australas. 2006 Jun. 18(3):299-301. [Medline]. Weber D, Shaw S, Winslow J. Traumatic eye swelling. Subconjunctival and orbital emphysema with orbital floor fracture. Ann Emerg Med. 2009 Oct. 54(4):635, 642. [Medline]. Crumpton KL, Shockley LW. Ocular trauma: a quick, illustrated guide to treatment, triage, and medicolegal implications. Emerg Med Rep. 1997. 18:223-34. Gerbino G, Ramieri GA, Nasi A. Diagnosis and treatment of retrobulbar haematomas following blunt orbital trauma: a description of eight cases. Int J Oral Maxillofac Surg. 2005 Mar. 34(2):127-31. [Medline]. Knoop K, Trott A. Ophthalmologic procedures in the emergency department--Part I: Immediate sight-saving procedures. Acad Emerg Med. 1994 Jul-Aug. 1(4):408-12. [Medline]. Lee KY, Tow S, Fong KS. Visual recovery following emergent orbital decompression in traumatic retrobulbar haemorrhage. Ann Acad Med Singapore. 2006 Nov. 35(11):831-2. [Medline]. Long J, Tann T. Orbital trauma. Ophthalmol Clin North Am. 2002 Jun. 15(2):249-53, viii. [Medline]. Peak DA. Acute Orbital Compartment Syndromehttp://emedicine.medscape.com/article/799528-overview. Medscape Reference Journal. 2005. [Full Text]. Rowh AD, Ufberg JW, Chan TC, Vilke GM, Harrigan RA. Lateral canthotomy and cantholysis: emergency management of orbital compartment syndrome. J Emerg Med. 2015 Mar. 48 (3):325-30. [Medline]. Mohammadi F, Rashan A, Psaltis A, Janisewicz A, Li P, El-Sawy T, et al. Intraocular pressure changes in emergent surgical decompression of orbital compartment syndrome. JAMA Otolaryngol Head Neck Surg. 2015 Jun. 141 (6):562-5. [Medline]. Soare S, Foletti JM, Gallucci A, Collet C, Guyot L, Chossegros C. Update on orbital decompression as emergency treatment of traumatic blindness. J Craniomaxillofac Surg. 2015 Sep. 43 (7):1000-3. [Medline].